Can you believe 2018 is already halfway through? That means yet again, another birthday is right around the corner for me! As they say… time flies when you’re having fun, and I am always amazed at just how much faster time seems to be going for me these days! While getting a little older can mean accomplishing dreams and goals, being able to have the funds to travel more, and in many ways, allow us to have more fun! It can, unfortunately, have its downside too. And living in today’s society means dealing with the pressure to look younger! Just this year I’ve seen more cellulite pop up and even my body start to change a bit. I’m having a harder time keeping weight off around my middle and my thighs. I’ve noticed my crows feet become a bit deeper and more and have watched as more and more sunspots have popped up on my face, making me cringe when I catch a glimpse of them in the mirror. Unfortunately dealing with changing faces and bodies are just a fact of life. I’ve found myself working more on coming into acceptance than trying to change the way I look. I’ve thought about many procedures in my life such as breast augmentation, botox, even an eye lift surgery. I asked for the eye lift surgery from my then-husband on my 35th anniversary and he actually agreed to it, but then I never even bothered to make the appointment. I realize I’m just not willing to go through some invasive treatments in order to get my youth, or at least the looks of it, back! Maybe working on accepting my body has actually worked, and I’ve really come to accept it and love it the way it is. I know I’m not alone in this and while there are some out there who will fight the aging process until the day they die, many of us are willing to look ourselves in the mirror and embrace the change and the beauty (yes, the beauty!) that comes with it! Just because we accept it, doesn’t mean we are giving up on it either. It just means that most of us are probably more comfortable with finding easier, more natural and less invasive ways to look like we’ve removed some years. As a beauty blogger, I’m constantly on the lookout for beauty products that do just that. And while I’ve found plenty of awesome skincare out there that can indeed work some miracles, makeup is one of those things I thought was pointless. In fact, as you get older, they tell you to put away the shimmer and sparkly eyeshadows and highlighter because it can instead draw attention to the lines, wrinkles, and sagging skin – and who wants that?! Yikes! I was actually just staring at my eyelids the other day and thought, well, maybe it’s time for me to put away the shimmery lids for good. These droopy lids are just collecting makeup in the crease -making one big shimmery, yucky mess! But then a tiny little miracle happened, and the new B-Glowing Beauty’s Gorgeous Illuminate + Shine Palette fell right into my lap! This amazing, palette full of beautiful sparkly and shimmery colors are actually MADE for the aging woman! Instead of making wrinkles and sagging skin stand out, B-Glowing Beauty has actually amazingly figured out how to instead give lids and eyes the appearance of a lift, make them look brighter and more youthful, and actually blur and minimize the appearance of fine lines and wrinkles – from using their makeup! I am nothing short of obsessed with this palette! Not only for its anti-aging abilities, and the fact that it works like an innovative skincare and actually works on skin to make it healthier and look more youthful the more you wear it, but also because the colors are so incredibly gorgeous and work so well together and with my skin tone – that I’ve had an absolute blast playing with different looks! The makeup stays put and somehow miraculously doesn’t clump up in the crease of my eyelid either! 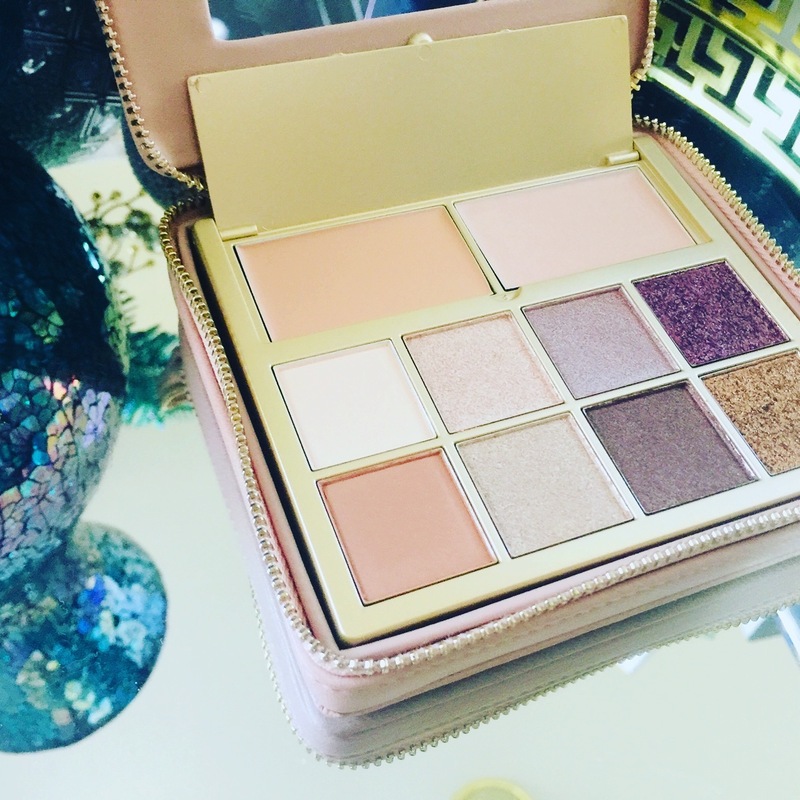 This beautiful palette has easily become one of my very favorite makeup palettes ever! And as you can bet as I continue to age, I will be sticking with it – thanks to its incredible ability to actually make eyes and skin look younger!